Tired of boring, conventional tattoos? One of the hottest “fashion” trends to hit the dental world recently are tattoos for your teeth. Some have opted to get red heart drawings inked onto their teeth while others have shown football team loyalties by having their favorite team mascot tattooed. Just like any ink tattoo on any other part of your body, teeth tattoos are completely permanent and can only be removed by abrasion and grinding with dental tools. These images are meant to last on your teeth for extended periods of time no matter what crunchy foods you eat. The process of getting an image onto the tooth is relatively simple. A specialist hand paints a desired image onto a porcelain crown, bakes the painted crown in a kiln, and finally the crown is applied to the tooth. Also known as “tatteeth”, this trend began at the Suburban Dental Laboratory based in Bloomfield, Connecticut. A tatteeth costs approximately between $75 and $200 and is not any more painful than a routine crown insertion. The tattoos do not cause any damage, have no side effects, and can be left in your mouth for years just like any other crown. 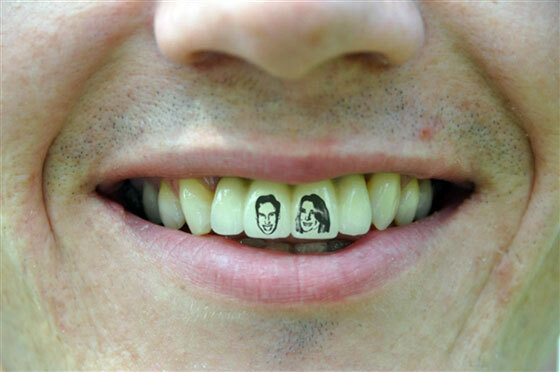 So, if you’re looking for a creative way to show off your pearly whites, this new trend might be right for you!